Happy Monday HarbourCats fans! The final week of the season is upon us, and forgive me if I get a little teary eyed (don’t worry, there will be a much more emotional column next week once the season is officially over). 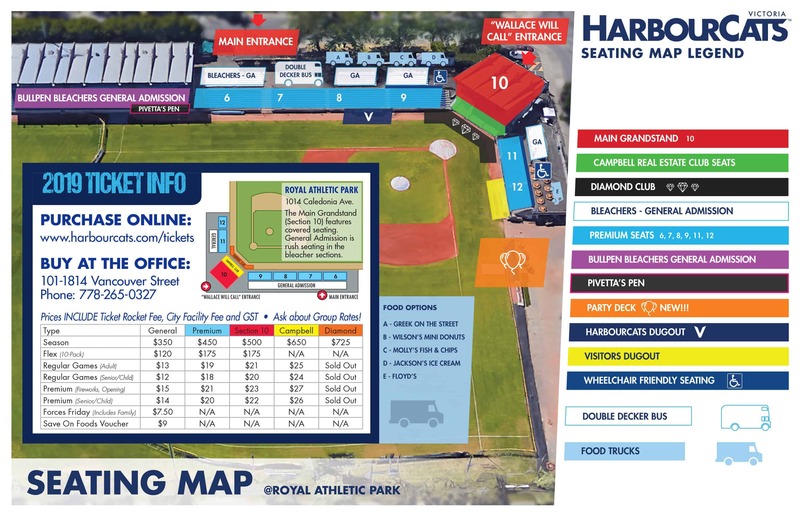 The HarbourCats are getting ready for the final home series of the regular season, and with plenty of postseason implication hanging in the air, Wilson’s Group Stadium at Royal Athletic Park will surely be rocking this week! On with the latest instalment of Beyond the Fence. NOTE: All stats for players of the week are collected from games played during July 30 – August 6 against Team Cuba, the Yakima Valley Pippins, and Wenatchee AppleSox. Position Player of the Week: OF Dustin Miller (Chico State) – In a 8-4 victory over the Yakima Valley Pippins on August 1, Miller knocked in four runs to increase his RBI total to 18 on the year, and also chipped in with two doubles and a single that propelled Victoria to their first of two massive wins over the North division leading Pippins. Pitcher of the Week: RHP Gunnar Friend (Avila University) — Also in the August 1 victory over Yakima, Friend collected his second pitcher of the week nod by posting five innings of two run ball. The righty out of Avila also collected four strikeouts to increase his season total to 24 in 30 innings pitched, and boasts a sparkling 1.84 ERA on the year. On July 30, for a game that has been a year in the making, the HarbourCats made WCL history by becoming the first team to play against a Cuban team. Victoria hosted Union de Reyes, a team from the province of Matanzas, and the U-20 team showed why their country is considered one of the premier baseball countries in the world. Team Manager April Shay helped bring members of Union de Reyes to Vancouver Island last summer, and taught them Canada’s favourite sport of hockey. Also part of their trip, the Cubans took in a HarbourCats fireworks game and travelled to Mt. Washington. Union de Reyes had placed second and third in their provincial tournaments for the past two seasons, and flexed their muscles early on. Cuba would score four times in the first two inning, before Ryan Ober would respond in the bottom half of the second with his first of two home runs on the night. The solo blast cut the Cuban lead to three, but Union de Reyes would score once more in the fourth and fifth to put the game out of reach and earn a decisive 8-4 victory. After dropping the exhibition game to Union de Reyes, the HarbourCats hit the road for their final two away series of this season. Victoria responded well from a heart-breaking series opening loss to Yakima, taking the final two games of the set to earn the series victory and inch closer to the Pippins atop the North division. The HarbourCats rushed out to a seven run advantage in game one, but slowly gave the lead away as the Pippins chipped away in the games latter innings. Dustin Demeter got the scoring started for Victoria in the first, smacking a line drive to the Yakima third baseman who committed an error which allowed Hunter Vansau and Nick Plaia on base to score. 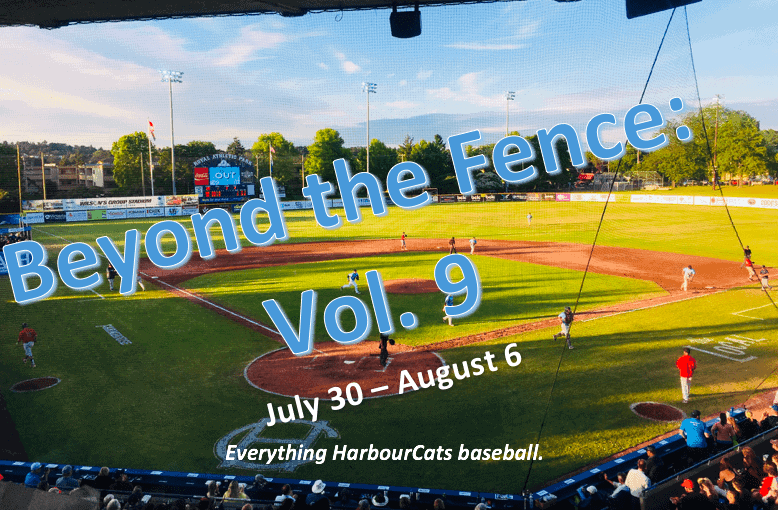 The HarbourCats then put a six spot on the board in the third, Victoria would send nine batters to the plate, and collect hits in six of seven at-bats at one point for a 8-2 lead. However, Yakima used three straight RBI singles in the fourth to climb within one run, and tied the game in the eighth before walking off Victoria in the bottom of the ninth for a 10-9 victory. In game two, the HarbourCats were down to their final strike, but used a frantic ninth inning rally to come from behind and stun the Pippins. Leading 4-2 heading into the ninth, Yakima sent Connor White close out the game, but the righty would have trouble with the heart of the HarbourCats order due up in the inning. The first three batters all reached off White in the ninth, and after getting two quick outs, Dustin Miller was down to his final strike but managed to smack a three-run double to jump Victoria ahead 5-4. After the HarbourCats added three more runs with two outs, Tyler Yoshihara pitched a scoreless ninth to secure the comeback win. Going for the series victory in the rubber match, the Cardiac ‘Cats used another ninth inning rally to defeat the Pippins for the second straight night. Yakima took a 5-4 lead into the ninth, and opted for Drew Hurst out of the bullpen one night after Miller blew the save. However, Hurst wouldn’t fare any better than his counterpart, loading the bases with two walks and an error. Jedd Fagg then played the role of hero by hitting a two-run single to put Victoria up for good. With the back to back wins, Victoria clinched the season series against Yakima, taking four of six total from the Pippins this year. Hitting the road for a short one hour bus trip up to Wenatchee, the HarbourCats must’ve forgotten their big bats in Yakima, scoring a total of nine runs in a three game sweep at the hands of the AppleSox. In the series opener, the AppleSox led from wire to wire, and used three consecutive home runs in the third inning for a 7-3 win over Victoria. The game was scoreless until the third frame, but Connor McCord’s grand slam opened the home run bridge, as Jacob Prater and Dawson Day immediately followed their teammate up with back to back solo shots to make it a 6-0 game. Nicky Gibbs and Jaxxon Fagg would both hit RBI singles to put Victoria on the board, but Wenatchee reliever Grady Miller would hold the HarbourCats to just a single hit in the games final four innings to clinch the win for the ‘Sox. Wenatchee starting pitcher Alec Gomez would stymie the HarbourCats in game two, as Victoria would be held to five hits in a 5-2 loss. The HarbourCats did score first in the second, but Wenatchee would respond with a run in the fifth before using a four-run sixth to put the game out of reach. Gomez finished the night with seven strikeouts in seven quality innings pitched on the mound, and his battery mate out of the bullpen Brian Marquez held Victoria to one hit over the final two innings to secure the series victory. Victoria would score twice off three errors in the field, but starting pitcher and cleanup batter Connor McCord held the HarbourCats in check the rest of the way in the finale, allowing only one earned run on the hill and knocking in three runs at the plate for a 11-4 Wenatchee win. McCord, a two-way player out of Western Oregon, owns a respectable 4.50 ERA pitching and also leads the team in home runs (6) and RBI (32). With the away portion of the schedule finished, the HarbourCats finished with a 12-15 record away from Wilson’s Group Stadium this season. As the calendar flips from July to August, it means WCL teams will turn their attention to the Second Half Pennant race to secure postseason berths. The 54 game schedule is broken down into two 27 game halves, with the first half coming to an end on July 4, teams that sit in first place in the North and South division after the first 27 games clinch a playoff spot — called the First Half division pennant winners.Then the teams will reset their record at 0-0 for the second 27 games, and the two atop the division at the end of the second set of 27 games will own the Second Half division titles and spots in the WCL playoffs. The Yakima Valley Pippins still lead the way atop the north division with a 15-9 Second Half record, while the HarbourCats remain four games back in fifth place at 11-13. However, even after the series sweep to Wenatchee, Victoria isn’t officially mathematically eliminated from postseason play. If the Pippins falter down the stretch and Bellingham, who won the First Half title and are currently tied for first with Yakima in the Second Half, take the back half title as well then the HarbourCats have an outside chance at clinching a postseason berth. The HarbourCats now return home for a date with the Portland Pickles, and a trio of promotions off the field. After tonights Fireworks game, the middle game of the series will be the popular ‘Jerseys off our back night’, before fan appreciation night in the regular season finale Wednesday night. That’s all for now! Enjoy your week Victoria, and come out to support your HarbourCats in the last home stand of the season! For tickets visit our office located at 1814 Vancouver Street, call us at 778-265-0327, or purchase tickets online.